Available for most KTM SX and SXF models . Titanium Grade 5 (Ti 6Al-4V) Known as the “workhorse” of titanium alloys, Ti 6Al-4V, or Grade 5 titanium, is 2x stronger than titanium grade 2. 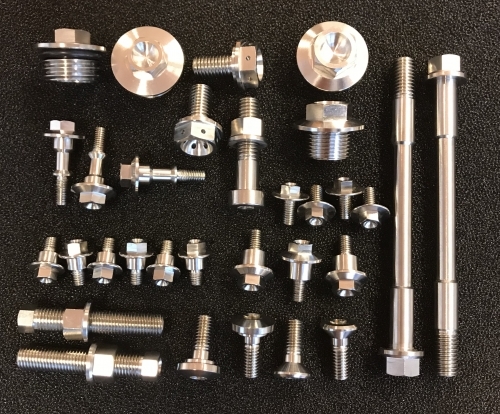 This alloy offers high strength and lightweight (half the weight of the stock steel fasteners), high corrosion resistance. Ti 6AI-4V finds many uses in the aerospace and motorsports. Fork Guard Bolt Kit KTM SX/F125/250-250/450 ( 6 Pcs.